Biocides Market size was above USD 8.5 billion in 2016 and expects significant gains. Demand for uninterrupted supply for fresh & safe water owing to rise in population growth rate in Asia Pacific and LATAM should drive biocides market size. Asia Pacific accounts for over 35% of the global water supply while global demand is expected to surpass 5,000 billion m3 by 2024. Growing health concerns from pathogens and bacterial growth should fuel market demand. They replace disinfectants like chlorine due to its non-toxicity and low environmental impacts. They restrict microbial growth in paints & coating products preventing discoloration and degradation. Global automotive paints & coating industry should surpass USD 15 billion by 2024 owing to rising demand from construction, marine, automotive and aviation industry. Biocides infer antimicrobial, antifungal and antibacterial properties which should strengthen product demand. Wood industry suffer huge losses owing to deterioration caused by fungi, insects and marine boring animals. This could be prevented using biocide as agent providing unsuitable condition for microbial growth, increasing timber durability contributing to forest conservation. Increasing offshore drilling activities to meet global crude and natural gas demand increases chances for microbial attack causing corrosion and spoilage. Global offshore oil & gas exploration activities spending should surpass USD 130 billion by 2024 driving along industry growth. They are used in oil & gas production, drilling and processing activities to reduce corroding effects on machineries and protect functional fluids from spoilage. Environment issues associated with emission from halogenated products with carcinogenic & endocrine disruption properties resulted in formulation of stringent regulations, norms and protocols causing hinderance in market growth. Strict regulatory framework to enforce industrial water treatment standards should propel product demand. Metallic biocides market size should witness growth at over 5% during forecast timeframe owing to its extensive application scope in disinfecting industrial water systems. It is highly effective in preventing algae formation inside ballast water treatment plants and are not usually used for human application due to its side effects. 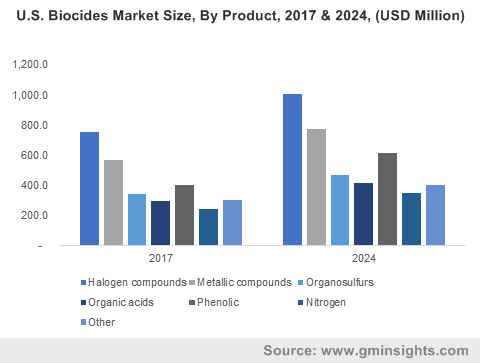 Halogen biocides market size should surpass USD 3 billion by 2024. It prevents microbial growth are less costly & efficient and is essentially used in disinfecting drinking water, cooling systems and surfaces. Bromine based products are preferred over chlorine due to its superior antimicrobial properties, less volatility, better toxicity profiles and fewer environmental regulations. Biocides market size with respect to paint & coating application should witness growth at over 6% during forecast timeframe. Microbial growth on painted or coated surface leads to aesthetic & physical degradation which may even occur during production & storage, they preserve and prevent microbial growth. Increasing application can be attributed to its antifungal, antibacterial and antimicrobial characteristics along with growing automotive & construction industry. Europe market size led by Germany, France and UK should witness growth at over 4% owing to its wide application outlook in construction, automotive and personal care industry. Increasing disposable income coupled with growing automotive industry should further bolster regional product demand. U.S. biocides market size should surpass USD 5 billion by 2024 due to its positive application outlook in water treatment industry. Strict policies and compliance standards set forth by government agencies should further strengthen regional product demand. China biocides market is also anticipated to show strong growth rates during forecast timeframe owing to wide application in water treatment and food & beverage industry. Low labor wages and production cost supports industry participants to set up manufacturing plants in the region. Increase in number of production facilities demands for inhouse water treatment facilities procreating higher product demand. Global biocides market share is competitive & consolidated and some companies operating in industry includes AkzoNobel, Albemarle, Troy Corp, Lonza, Solvay, BASF, Lanxess, Dow Chemical and Clariant. Industry participants are shifting their supplier & production bases towards Asia Pacific to avail low labour rates, government subsidies and raw material availability. 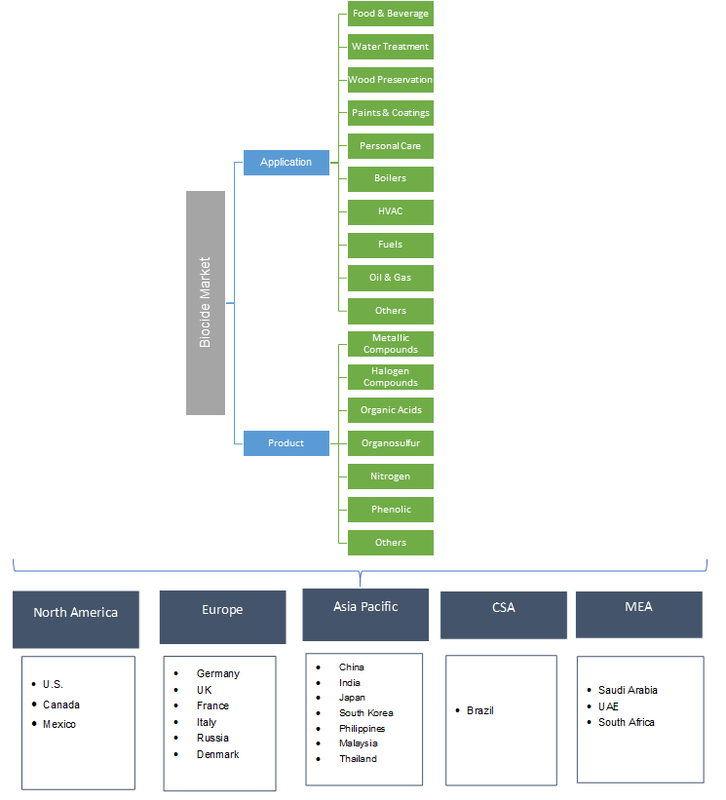 Companies are also partnering, acquiring and merging to size up production capability and strengthen regional presence. Biocides are disinfectants intended to destroy, prevent and exert controlling effects on undesired microbial growth in machineries, pipelines, water bodies, food & beverage, wood and other personal care products. Use of these product increases shelf life and helps save significant proportion of incurred production cost. These products intend to kill organisms and pose significant risk to human health and requires great care while handling. Anti-fouling paints utilizing organic tin compounds such as TBT has proven to have long lasting impacts on marine ecosystem and is banned in many countries from application in commercial and recreational vessels.